Union members have joined in protests with climate activists and others this year. 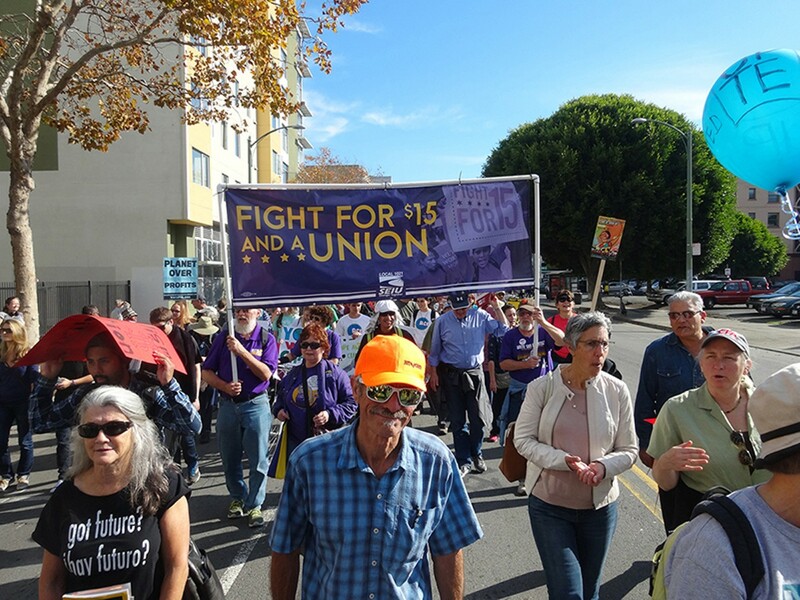 Bay Area labor unions had a big year in 2015, waging battles for social, economic, and environmental justice, not only to benefit their own members, but for the common good. Labor's signature achievement in 2015 was the breakthrough Fight for 15 campaign. The proposal to raise the minimum wage to $15 gained mainstream legitimacy this past year among not only workers, but also an increasing number of politicians and business leaders. Even mainstream economists like Lawrence Summers of Harvard University now argue that worker power, expressed through unions, is the best bulwark against rising inequality. 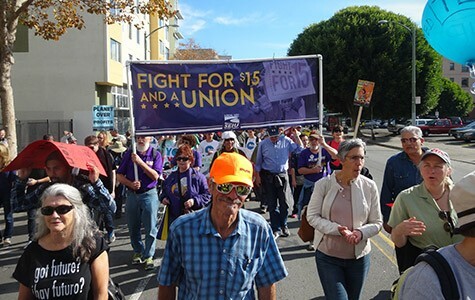 In 2015, East Bay workers followed up their victorious 2014 minimum wage ballot measure in Oakland and new minimum wage laws in Berkeley and Richmond with a push toward the $15 mark. Emeryville passed one of the highest city minimum wages in the nation this year — it will reach $16 by 2019. "The success of the Lift Up Oakland ballot initiative in 2014 gave us more incentive to push forward, especially toward the 2016 election, so now we're focusing statewide so that everyone in California will benefit from raising the minimum wage," said Shonda Roberts, an Oakland fast-food worker and organizer. Another noteworthy trend in 2015 involved unions becoming increasingly focused on issues that are not directly related to the representation of their members on the job. For example, Service Employees International Union (SEIU) Local 1021, which represents 54,000 public and nonprofit workers in Northern California, worked to build a progressive coalition centered on a broad social justice platform. "In some ways, the definition of the labor movement has expanded in the Bay Area," said Gary Jimenez, vice president of Local 1021. "We are working together in a larger, progressive coalition that includes housing activists, immigrant rights fighters, and Black Lives Matter. Economic inequality is the issue of our day and it is driving new kinds of organizing. It's very exciting." Other Bay Area unions are also spearheading campaigns for the common good. The Oakland-based California Nurses Association (CNA), for example, has been leading an effort to stop the secretive Trans Pacific Partnership trade agreement and has helped organize climate justice rallies, including opposition to a proposed coal export terminal on Oakland's waterfront. In May, members of the International Longshore and Warehouse Union Local 10, who handle cargo at the Port of Oakland — one of the busiest US seaports — stopped work to protest against police brutality. Rallying near the gate of an idle port terminal, Bay Area longshore workers were joined by labor leaders representing BART train operators, city and county workers, port workers from Los Angeles, and hundreds of community members. Yet despite all this, union strength remains fragile. A serious threat to the power of public sector unions emerged in 2015 when the US Supreme Court agreed to hear a case, Friedrichs v. California Teachers Association, contesting the mandatory fees paid by public sector workers who enjoy the benefits and representation provided by union contracts, but who aren't members of the union that bargained for those contracts. "This lawsuit is one more attempt of the moneyed class to use their power and influence to weaken protections for working people," said Trish Gorham, president of the Oakland Education Association, the main teachers' union in the city. Gorham said that if labor loses the case, "the teachers, firefighters, and nurses who provide vital public services will struggle even more to maintain their tenuous place in the shrinking middle class." A ruling against the unions would decimate public union treasuries and the ability of unions to engage in political campaigns — an outcome that conservative foes of organized labor have been trying to accomplish for decades. Friedrichs will be decided in 2016, and the odds look ominous for labor. As if existential threats like Friedrichs were not enough, this year, healthcare union leaders remain pitted against one another in brutal fights over strategy, leadership, and turf, wasting tens of millions of dollars of worker dues. A three-person ego-driven cage match continued during the year, involving Dave Regan of SEIU-United Healthcare West (SEIU-UHW), Sal Roselli of the National Union of Healthcare Workers (NUHW), and Rose Ann DeMoro of the California Nurses Association (CNA). NUHW, a militant split-off from SEIU, successfully negotiated a good contract for its Kaiser members after a multi-year struggle. But it has had a difficult time adding members and maintaining financial stability. Two years ago it merged with the CNA, but then CNA leadership officials misfired when they spent millions on NUHW's bid to wrest tens of thousands of Kaiser members from SEIU-UHW. NUHW/CNA suffered a crushing defeat in a subsequent decertification election, however, and the alliance is now on the ropes. This year the state and national leadership of SEIU also mounted an effort to curb the power of SEIU-UHW's Regan. Sadly, the two groups now have dueling state-wide minimum wage initiatives headed for the November 2016 ballot in California. If the unions don't settle their differences and back one initiative, confused voters may reject both. The most unusual development in California's labor movement in 2015 was the rise of New Labor nonprofits. Mainly financed by foundations, these groups emphasize worker betterment rather than worker power. New Labor leaders are smart and full of energy, and want to succeed, but some of them seem to be hampered by a fascination with Silicon Valley, and appear to be naïve about the extent and harm of corporate power. One interesting experiment is the Workers Lab, an Oakland-based incubator that mimics a venture capital accelerator. The Workers Lab is trying to apply the principles of Silicon Valley to worker organizing — supporting young, energetic activists hoping to build the killer organization and app to benefit workers in exploitative industries. Another is the Restaurant Opportunities Center, or ROC, which also has a large Bay Area presence. ROC has developed a training app, TopServer, for restaurant workers who wish to advance from lower paying food gigs to higher paying fine dining establishments. ROC recently entered into a relationship with the Ella Baker Center — a well-known, Oakland-based racial justice nonprofit — and Google funders to open a restaurant in Oakland. The eatery will pursue a high-road model, paying its employees well. Meanwhile, on-demand economy workers increasingly realized in 2015 that Uber and other companies are not what they seem — that it's a fallacy to think that these businesses are some kind of wonderful new creation for those seeking to maintain middle-class lifestyles. This year, Uber drivers confronted the company's leadership, moving ahead with a class action lawsuit alleging that Uber has been fattening profits at their expense by misclassifying them as "independent contractors." The case may go to trial in 2016, and if the drivers win, it could be a significant victory against the on-demand industry. Unfortunately, in 2015, a number of New Labor groups lent their names and credibility to tech companies and investors who are trying to stop worker misclassification lawsuits — like the Uber case. For example, in October, the nonprofit National Domestic Workers Alliance, the Freelancers Union, and other New Labor groups joined with on-demand companies, including Lyft and Handy, in an open letter calling for a set of "portable benefits" that would allow independent contractors to obtain employment benefits on the open market or through a new government program. However, the effort lacked any discussion of worker involvement or the willingness of companies to pay what is needed. And given that the profits of many on-demand businesses are largely due to non-payment of benefits, like Social Security taxes, for their workers, participation by New Labor was unfortunate. But New Labor folks appear to be well-intentioned, and any fledgling effort is bound to make mistakes. The question is, what will happen in 2016. One final bright spot this year was the cooperation in the global labor movement to achieve worker protections in sweatshops, especially in the garment and electronics industries. In November, the international labor movement signed a global compact with H&M, the Swedish clothing mega-retailer, to do away with dismal working conditions at the chain's Asian factories. H&M is a popular brand in the Bay Area and has a store in Emeryville. "[The compact] covers 1.6 million workers in 1,900 factories worldwide," said John Logan, a professor of labor studies at San Francisco State University. Global compacts are no panacea, but given the pace of globalization, the strategy is worth watching. And for soccer fans, Sharan Burrow, head of the biggest international union federation, has led the fight for justice for the oppressed workers building the World Cup 2020 facilities in Qatar.